Neuroscience deals with the brain (nervous system). -- does a neuroscientific approach exclude other possibilities to explain thought processes ? on the other hand: Aristotle localised mental functions in the heart - so why do we now understand the mind in relation to the brain? first step: the idea of central information processing - where does it come from ? what evidence supports the general claim that the brain is responsible for control of behaviour and the seat of reason (and emotion) ? 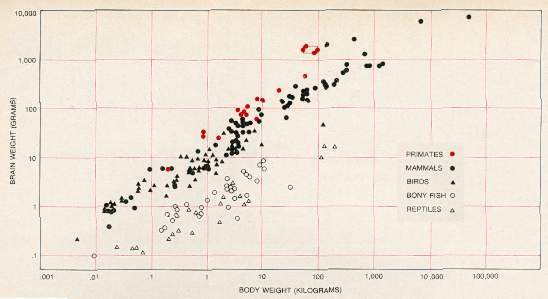 brain size varies with body size: elephants and whales have larger (heavier) brains than humans, but these brains contribute to a smaller fraction of their overall body weight. comparing different animal groups, it is obvious that relative brain size is larger, for instance, for primates than for other mammals, and much larger for mammals than for fish or reptiles. a continuously growing body of evidence demonstrates that brain damage due to injuries or chronic/acute disease changes the intellectual capacities and personality of patients. note: systematic observation & experimentation is used to replace pure speculation based on traditional knowledge !! with all the achievements of 20th century science, would it be possible to map the mind ? on a large scale the outside world represented in functional compartments: brain regions that ar specialised fro particular tasks. this concept can be found through the whole history of neuroscience: the localisation of specific functions in particular brain regions ! the localisation of functions in the brain ventricles from the antique tradition was copied in the early anatomical studies of the Renaissance genius Leonardo ! 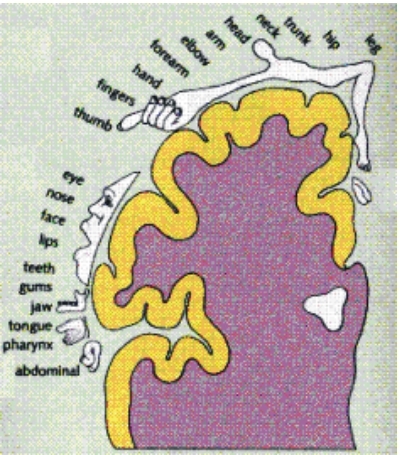 the basic concept: the brain is composed of many particular organs, which are reflected by the shape of the skull: bumps (extensive measurements) can be interpreted as predominant development of particular ‘faculties’, such ideas dominated popular science in the 19th centuru and were still influential in the 20th century. a scientific approach has to replace the incidental observation by systematic analysis of causal relationships - the function of neurons is a good starting point for such an endaveaour. mapping of the environment on the brain requires extended networks of neurones, which are most obvious in the visual system: retinotopic maps are generated in the cortex from a parallel network of functionally identical units covering the visual field with small receptive fields - histology (the microscopic study of living tissues) can open the view on the architecture (and thus, design!) of the brain ! Cajal 1911, columnar structure in cerebellar cortex: could be the basis of a map! Tan, a famous patient presented by Paul Broca (1824-1880) at the Paris anthropology meeting in 1861, had longstanding language difficulties (‘tan’ was the only word he could speek) - extensive frontal lobe damage was revealed in autopsy. 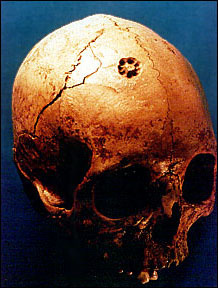 several similar cases were used as motivation to suggest the principle of discrete localisation of psychological function, which was sometimes regarded as independent vindication of Gall’s phrenology (but a direct connection between these two areas of inquiry were not established). they provide indirect functional evidence for localisation and mapping in the human cortex. this combination of cyto-architecture & functional anatomy prsents a picture of the cortex that today is still used as reference! furthermore, various features are superimposed in these maps, like eye of origin, preferrend orientation, motion direction, spatial frequency, etc. is the mind ultimately depending on (or embodied in) the brain? is the brain the machinery of the mind? are they one and the same thing? are they separate? Changeux, J P, 1985� Neuronal Man - The Biology of Mind.� New York Oxford:� Oxford University Press. 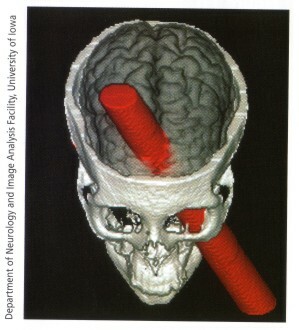 Gross, C G, 1998� Brain Vision Memory - Tales in the History of Neuroscience.� Cambridge MA:� MIT Press. 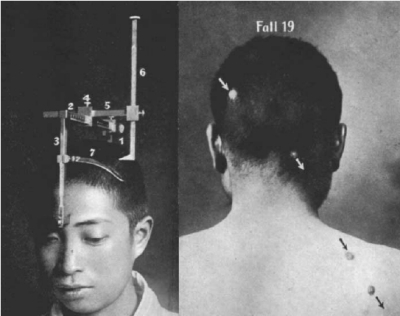 Inouye, T, 1909 Die Sehstorungen bei Schussverletzungen der kortikalen Sehsphare nach Beobachtungen an Verwundeten der letzten japanischen Kriege. Leipzig: W Engelmann. Poppelreuter, W, 1917 Die psychischen Schädigungen durch Kopfschuss im Kriege 1914/16 mit besonderer Berücksichtigung der pathopsychologischen, pädagogischen, gewerblichen und sozialen Beziehungen. Leipzig: Voss. Shepherd, G M, 1991� Foundations of the Neuron Doctrine.� New York Oxford:� Oxford University Press. Thorne, B M, Henley T B, 2001 Connections in the history and systems of psychology. Boston New York: Houghton Mifflin Company.